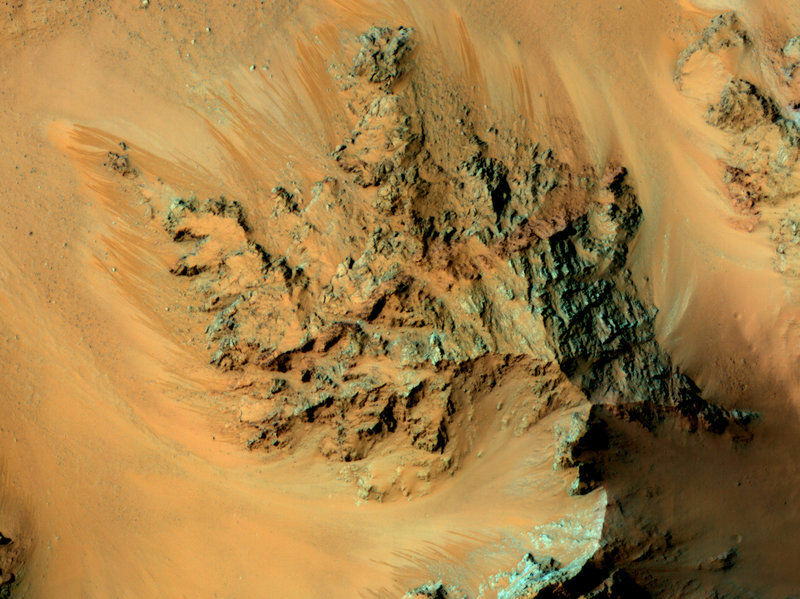 Data from NASA's Mars Reconnaissance Orbiter provides “the strongest evidence yet that liquid water flows intermittently on present-day Mars,” NASA announced on Monday. Photos from the Mars orbiter show dark streaks flowing down Martian slopes. The streaks appear in sunny spots or when the weather is warm, and they fade when the temperature drops. The following animation "simulates a fly-around look at one of the places on Mars where dark streaks advance down slopes during warm seasons, possibly involving liquid water," NASA says. "This site is within Hale Crater. The streaks are roughly the length of a football field." "We don’t know where the water actually comes from. That’s the next puzzle,” said Michael Meyer, lead scientist for NASA’s Mars Exploration Program, at this morning's announcement. "We haven’t seen rain on Mars because the surface pressure is way too low," said John Grunsfeld, a physicist and former NASA astronaut. "But we have seen snow … so there is a water cycle." Some of the hypotheses include an underground aquifer, accumulations of humidity, or possible seasonal melting, though there is a counter for each. (Like an aquifer extending into mountainous regions, possible lack of sufficient humidity, or lack of regional surface ices, respectively.) The team also is working under the idea that it could be a mix of all of these. 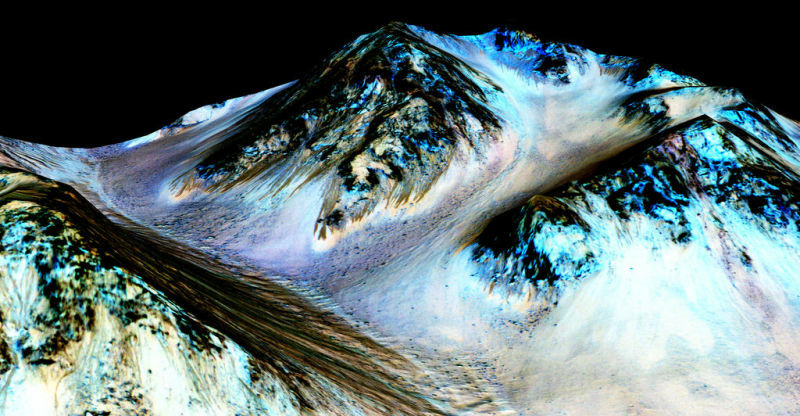 An abundance of evidence exists that surface water flowed on Mars billions of years ago. In 2008, NASA scientists confirmed the existence of frozen water on the planet. In 2010, the space agency announced it had found evidence of subsurface water. In 2013, the Curiosity rover found water in Mars' soil. Alfred McEwen, principal investigator for the High Resolution Imaging Science Experiment (HiRISE) at the University of Arizona in Tucson, said it's "very likely” that there is microbial life on the subsurface of Mars. The agency’s Jet Propulsion Laboratory in Pasadena, California, a division of the California Institute of Technology, manages the Mars Reconnaissance Orbiter Project for NASA's Science Mission Directorate, Washington. Lockheed Martin built the orbiter and collaborates with JPL to operate it. Jon Brooks, NPR and Associated Press contributed to this post.